As you may know last week was a bit rubbish (to put it mildly). My best friend went to sleep for the final time and then I woke up with tonsillitis. Painful as it all was I took some consolation from the fact that it was my birthday next week and at least this hadn’t happened then – things could only get better. And they did… for a while. Monday and Tuesday came and went without a hitch and Wednesday descended into a mad scramble to finish the song and tidy my house before my birthday arrived in the small hours of Thursday morning. I almost managed it as well. 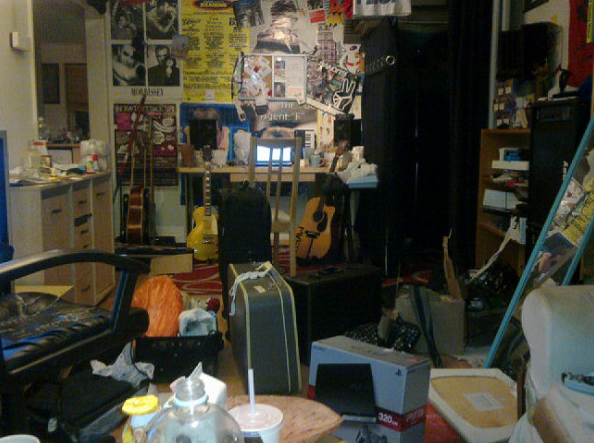 The song was 90% finished and the house was 50% tidy. My brother and his wife arrived at about 1am and we did what brothers do best (play FIFA) while his wife tidied the kitchen (bless her). 2am and we began the 3rd and final game of the night, having won one and lost one. We went 1-0 up nice and early and my arms started to itch. I thought nothing of it and played a lovely through ball over the top. 2-0 (Danny Welbeck) and my legs had joined in. ‘This is weird’, I thought, before spraying the ball out wide to Valencia. 30 seconds later and it’s still 2-0 but I can no longer concentrate – everything itches. What’s going on here then!? FIFA stopped and the panic started. After a bit of googling and a call to NHS direct it became apparent I was having a ‘moderate/severe’ allergic reaction to Penicillin – the drug I’d been taking for 6 days since being diagnosed with tonsillitis. 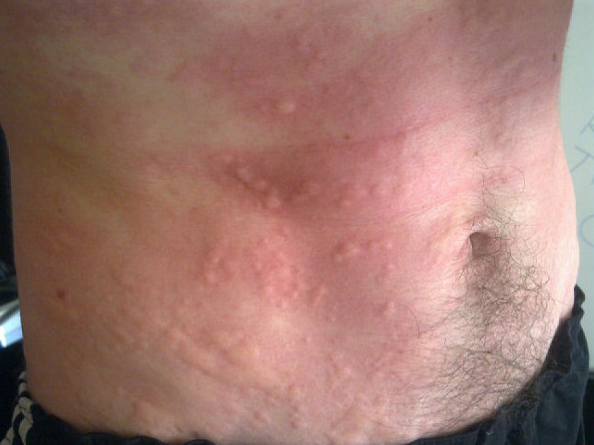 My chest was tight, my lips had gone really pale and about 50% of my whole body was covered in rashes and little bumps. Here’s my stomach. Pretty, isn’t it? I’ll spare you all the ins and outs but the next 6 or 7 hours were some of the worst I’ve ever had. After a Macdonald’s breakfast, 50mg of prescribed steroids and some antihistamine tablets I went back to bed (at around 10am) and managed to sleep for a couple of hours before waking up and feeling much better. The rest of the day came and went. I spent the afternoon with my family and we went for Tapas before I went out in the evening for some birthday drinks. The doctor had told me not to drink alcohol but I figured I was over the worst and one or two wouldn’t hurt. Trouble is, it’s never one or two is it?! I felt pretty ill and pretty itchy when we got home and it didn’t take me long to figure out that I was an idiot. Both Google and the state of my arms, legs and chest confirmed that alcohol stops the steroids from doing their job. Good thing about alcohol, though, is that it makes sleeping a lot easier so after drinking lots of water and necking another antihistamine tablet I drifted off to sleep. I woke up around midday this morning, tired and hungover… but no longer covered in rashes and not feeling like I was about to faint. Result! It’s about a girl I was with a few years back. It only lasted 3 or 4 months and I always knew she wasn’t the one – but I started writing this a few days afterwards when part of me was still convinced I’d let a really good thing go. Nothing bad happened… I just didn’t try hard enough to make it work. She’d been trying her hardest but I’d been fully preoccupied with me and my guitar. Standard. This week I’ve been playing around with a few different ideas on the production. There’s now a piano version of the song, a guitar version of the song and also a ‘dancy’ version of the song. This (final) version seems to take a little bit out of each one and meet somewhere in the middle. “My body’s still here but I’m miles away” – Self explanatory. “I trod on your skirt so you trod on my ego” – True story. On a night out in Guildford. “You were trying to reason, I was trying to rhyme” – Often the case. I’m good at avoiding reason. “Late nights, long days. This love will never ever go away” – Probably my favourite lyric. Maybe because of the relevence it has to my life right now. Music, music, music.